Website Tips – Tour Real Estate Inc. REALTORS: The QR Codes are HERE! 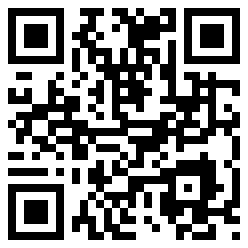 Tour Real Estate Inc now provides QR codes for our REALTOR website customers! You can find QR codes several places in your Client Toolbox. The QR Code for your main website URL is under your Personal/Team/Office Settings. Each of your listings also has it’s own QR Code in the Your Listings section. In addition we’ve added these QR codes to our Produce Flyers function as well so you can print listing flyers with these codes to distribute! QR codes are similar to traditional bar codes in that they use simple color patterns to convey information digitally. These codes when scanned with a modern smart phone can include links to websites, text, or contact information. They are most commonly used in print advertising to direct mobile users to a website offer or information page; can be a great way to breathe new life into print media advertising. Are you looking for the best REALTOR websites online today? Unhappy with your current website? Want a website that puts you in control of your content and search engine visibility? REALTOR websites from Tour Real Estate do all that and more! Contact us today to find out how we can help you strengthen your online presence. Are you a REALTOR who is active on Twitter? Want to share your tweets on your website using our dynamic system that writes your tweets in text that search engines can read? You’re in luck! Follow the instructions for entering your Twitter feed URL and you will be all done! 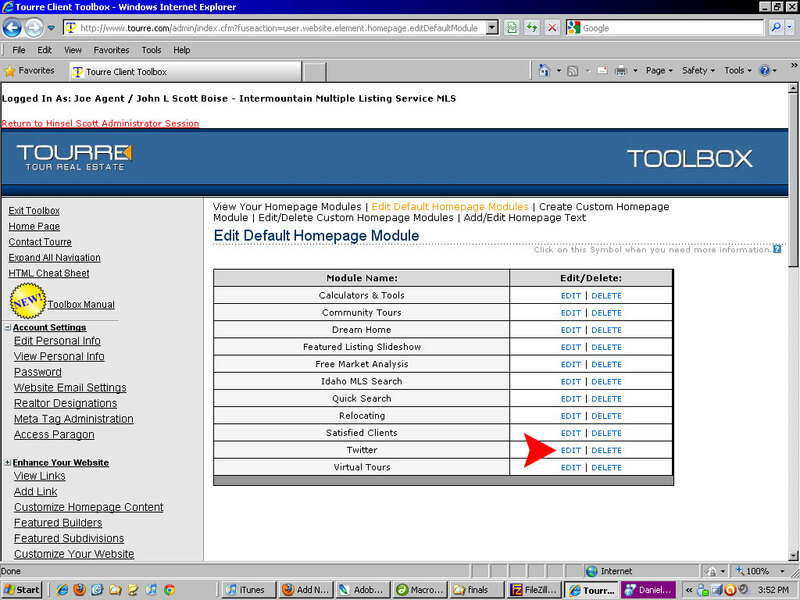 Feel free to visit the main Customize Homepage Content section to arrange your homepage modules as you desire! 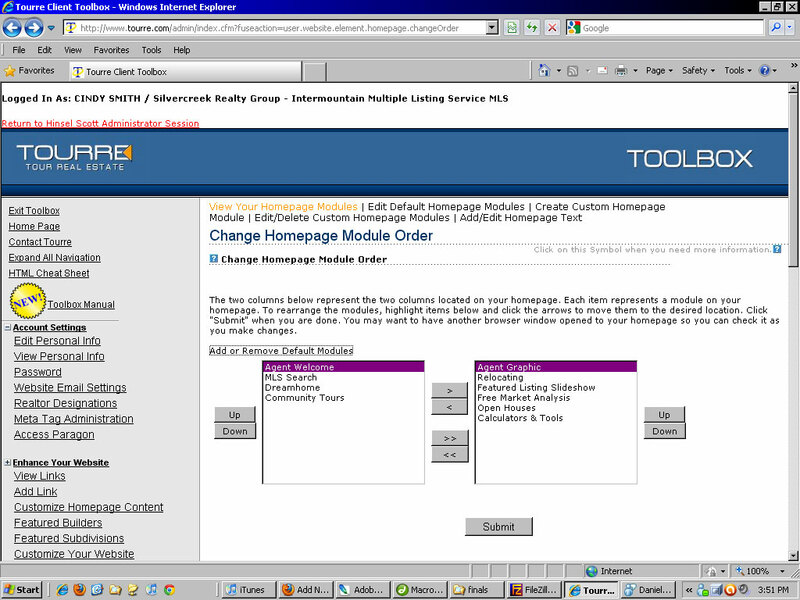 Just one more tool in our list of online real estate marketing tools that you can control from your Client Toolbox! Does your REALTOR website do all of these things? Does it provide lead capturing ability, craigslist ad creation, comprehensive statistics, and the ability to control your search engine visibility? 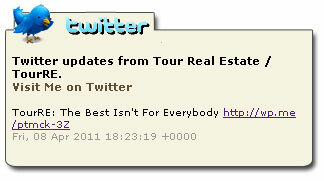 If not you should contact Tour Real Estate today to see what we can do to help your with your online presence. Tour Real Estate strives to provide the very best REALTOR websites online today. Part of that mission is to assist our customers in any way we can to better improve their content and it’s reception by visitors and search engines alike. For a lot of today’s real estate professionals blogging is a real problem spot, either they don’t understand how it is done properly or simply don’t have the time to spend creating quality content. In this blog entry we hope to cover both of those issues by demonstrating how you can use your listings, with the text you’ve likely already created, as a useful blog entry. Thank you for visiting my Boise Real Estate blog! If you are looking to buy a home in Boise, this is the place to start! Check out my latest listing! The rustic charm of light pine floors, open-beam, knotty pine ceilings offers a country lifestyle yet very accessible to downtown Boise and BSU in this well-established neighborhood. Large upstairs bedroom has full kitchenette and waterslide as well as separate outside entrance. Unique lighting and built-ins throughout, secret bat cave and more. A large wrap-around, covered dovered deck is an asset for summertime entertaining. Interested in this Boise Home? Maybe you aren’t sure where to start? There has never been a better time to buy a home in Idaho – contact me Joe Realtor today to find your dream home! That took all of about one minute to do in all honesty. You will note that I followed some of the tips from our Write a Better Real Estate Blog entry by bolding some of my text and also adding links to my keywords…like: Boise Real Estate. Just swap those keywords out for whatever your target market is and you’re well on your way to not only creating more backlinks to your site but also driving more traffic to your site. DON’T just post a photo or video with no text. You might as well not even blog. DON’T forget to include keywords in your blog entry. DON’T forget to include links to your main site in your blog entry. DON’T duplicate or be guilty of copy and paste blogging. Search engines are changing their rules and this will soon be a costly mistake as value will be placed on the originality and actual usefulness of the blog content. 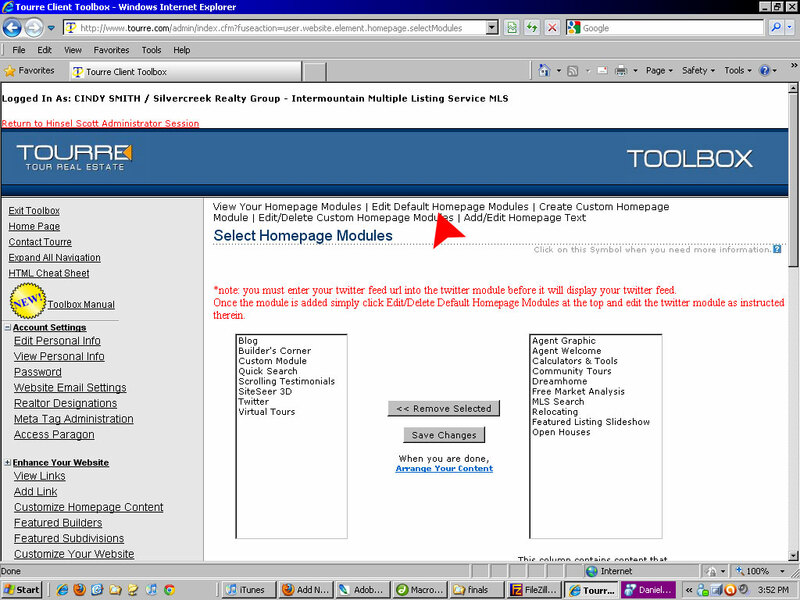 Link your blog to other social sites like Facebook or Twitter so when you post it gets copied there automatically. Leverage your social sites and main site to drive traffic to your blog – it works just like a regular site; if no one knows it’s there it does little good. Make sure if you have the ability to add an RSS feed of your listings to your blog that you do so, this helps listing visibility as well as linking. We at Tour Real Estate understand today’s technologically driven real estate market. We provide the very best REALTOR websites online today that help put YOU the agent in control of your digital presence. Contact us today to find out how we can help you move more real estate!